Caroline, Jeb, Teddy and literary dynasties: Bully! So Caroline Kennedy, holder of a fabled name, wants to take over the Senate seat of Hillary Rodham Clinton, holder of another fabled name — but not if Andrew Cuomo, son of a prickly politico also named Cuomo, has anything to say about it. And Jeb Bush, holder of a recently soiled name, has decided that this isn’t the greatest time to join the Senate from the great state of Florida, even if his dad, the founder of America’s most recent presidential dynasty, says Jeb would be a boffo president someday. Why should anyone be surprised that politics is a family business? We’re used to it in the arts. Theater and the movies positively wallow in it, from the Booths to the Royal Family itself, the Barrymores (I have a soft spot for the 2007 movie Music and Lyrics, with Drew Barrymore and Hugh Grant, a piece of cinematic fluff that seems to me to catch a lot of the spirit of the old screwball comedies) to all those hard-to-sort out Baldwins and Arquettes and Sheens. Writers, too. There are the Buckleys (I don’t care which way your politics lean; Christopher’s blog at The Daily Beast is one of the funniest things on the Web these days) and, as Rose City Reader reminds us, the Amises, and here in Oregon, William and Kim Stafford, and … you get the idea. They don’t make presidents like Teddy anymore, which is a good and a bad thing. 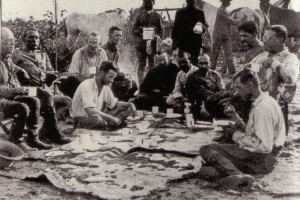 He was an imperialist meddler and a guy who longed to get into a good war; an impetuous can-do sort with all sorts of contradictions: One of our earliest and most important conservationists, he was also a voracious big-game trophy hunter. Teddy was an outsized personality, and John Alexander’s spot-on parody of him as a nut case charging up the stairs and burying stiffs in the basement in Arsenic and Old Lace brings tears of laughter to my eyes every time I see it. 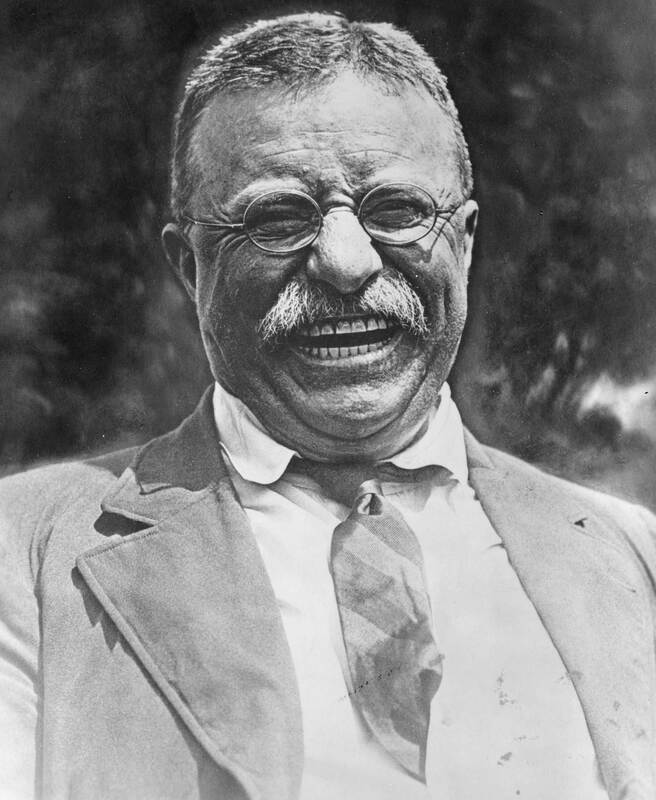 His style of leadership and a lot of his beliefs are clearly outmoded, and we don’t need another TR in the White House. Yet in another way he was a brilliant president. A man of action, of uncanny energy, of supreme self-confidence, he was the spokesman of his age. In a way, he WAS America. And that unfiltered optimism is something we can look back on with pleasure and regret that, as a nation, it’s slipped out of our grasp. Ah, to be so boldly sure of things! I have a lot of reading still to do in The River of Doubt. Teddy and company haven’t quite reached the river that would come to be named after him, although it’s clear that things are beginning to unravel catastrophically. But while dynasties are on my mind I want to pass along a couple of examples from Millard’s book of the singularity that was Teddy Roosevelt. As a child, Roosevelt had been close friends with Henry Fairfield Osborn’s older brother Frederick, a bright little boy who had a passion for birds that rivaled Roosevelt’s own. The two boys had been known to spend entire days together tramping through forests in search of interesting animals. On one such day, young Roosevelt, to his delight, had spotted what he believed was a new species of frog. His pockets already bulging with other specimens, he placed the frog on his head and clapped his hat down over it. The temporary measure seemed satisfactory until Secretary of State Hamilton Fish and his wife appeared on their afternoon drive along the river. As soon as they saw the carriage coming toward them, both boys obediently doffed their hats, and the frog, taking advantage of the situation, leapt off Roosevelt’s head and made his escape. That sounds like a story by Mark Twain. Like Teddy — and like that other Roosevelt, who cut his own swath — he was a singular American, too. Unlike Teddy’s, though, Twain’s relatives didn’t go into the family business. Some things just can’t be replicated.